What better place than The Winery Restaurant and Wine Bar, winner of multiple awards at the Golden Foodie Awards including Golden Chef to Chef Yvon Goetz, for an intimate tasting for about 20 of OC's food writers, bloggers, and media? My thanks goes out to Mona from moxxe pr for the invitation to attend and meet Chef Jet Tila. The event was a kick-off to the new radio show, "The SoCal Restaurant Show," which airs every Saturday at 10:30am on AM830 KLAA with Chef Jet as the host. The evening started off with some introductions including to David Baronfeld, General Manager of KLAA, and Chef Goetz from the Winery. Next was a special treat - a cooking demo! Chef Tila was an entertaining host for his own demonstration as he prepared a crunch roll for our viewing (a specialty dish at Wazuzu at Encore at Wynn Las Vegas). He explained the process and how to handle sushi rice ("press it about as hard as you'd press a chick") as he went along. Made of tempura shrimp, English cucumber, avocado, nori, and some special recipe miso sauce, this inside out roll was "fancified" by being rolled in Japanese rice pearls (whose actual name I don't know how to spell but remember how it sounds). The masterpiece was then presented to our table in addition to the appetizers about to be served. So what was in store? It was a combination of Chef Goetz' offerings and Chef Tila's for the night. Our appetizers were two pieces of the crunch roll and a slice of seared rare ahi tuna with a mango cucumber salad dressed with a cilantro-orange vinaigrette. Absolutely lovely. I haven't had Japanese rice pearls on my sushi before but I think I should look out for them. They were lightly seasoned and popped in my mouth as I had them with the sushi. The tuna was so soft and well-seasoned around. I greatly enjoyed the citrusy salad that really cleansed the palate and refreshed after each bite of the tuna. Afterward, we experienced the amazing Alsatian "Pizza" which some at the table claimed was their favorite dish available. It was a flatbread with crème fraîche, applewood smoked bacon, Gruyere, and green onions. You've got me hooked when you start speaking about cheese with bacon but nothing can live up against this type of cheesy bacon-ed flatbread goodness. It was savory and warm, mixing saltiness with a richness only crème fraîche can bring. This was easily one of my favorite "pizzas" tried. All while this was going on, we were also being quite informed about wines as the sommelier Sir William Lewis poured well-paired wines. With Chef Tila's rendition of chicken & waffles, we got a Ponga Pinot Noir 2010 from New Zealand for its maple tint and soft play on our tongues. It was necessary alongside the too-delicious chicken and waffles offering which came in its own mini cast-iron dish. A buttermilk-crisp juicy chicken breast atop of thick, sweet waffle smothered in Sriracha maple syrup (innovation! ), this was my and most everyone on my side of the table's favorite dish of the night. It's served for Sunday brunch at The Charleston in Santa Monica if you're interested...and take me with you please? Anyhow, shortly after that, we got our last taste for the night - Chef Tila's drunken noodles which was famed for being Giada De Laurentiis' favorite for Food Network's "The Best Thing I Ever Ate." We asked why they're called drunken noodles, and his response was that they are pretty much the go-to dish people want when they're wasted. That sounds plausible enough! I liked the fat rice noodle pieces a lot, and the sauce was strong. It's too bad I had the chicken & waffles before this because the drunken noodles certainly didn't seem as good after that masterpiece. We were paired with a 2011 Riesling from Washington's Columbia Valley. "Fusion is not the word anymore. Everything's a 'mash-up' now." Overall, a wonderful night, especially seeing everyone again. If you haven't thought about it yet, do so now and remember to tune into "The SoCal Restaurant Show" on Saturdays. If you can't, listen to their podcasts which will be up shortly after. 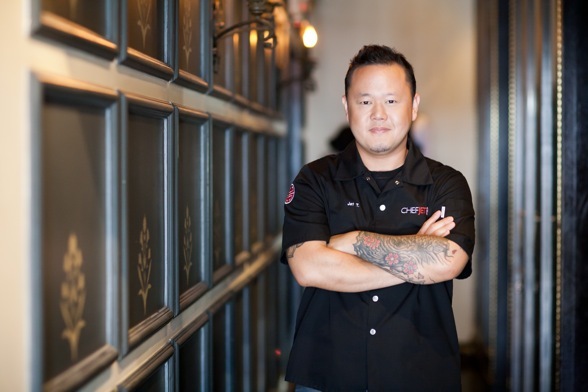 Chef Tila, a Southern California native who opened the highly acclaimed Wazuzu restaurant at Steve Wynn’s Encore hotel in Las Vegas and appeared on Anthony Bourdain’s “No Reservations” and on “Iron Chef America” on which he battled Chef Morimoto, is the host and has been planning to have several of food's top hitters on the show. I'm looking forward to it myself (I have no choice anyway - he made us promiseeeee)! Photography by Minerva Thai. Photos available on Facebook.